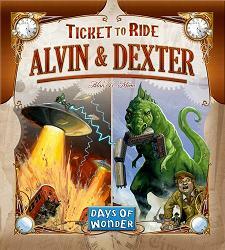 Meet Alvin the Alien and Dexter the Dino - two wacky Ticket to Ride characters who stomp your opponents and zap their tickets in this fun, yet challenging expansion. Alvin & Dexter turn any destination they inhabit into a City in Chaos, blocking routes from being built there! The Alvin & Dexter Monster Expansion includes two highly-detailed monster figures, 20 Monster cards, two Bonus cards, and multi-lingual rules.